In 2004, at her children’s request, Annie Humphrey enrolled them into public school and took them all off the road. Gradually, she stopped writing and traveling and performing. She got a job working 9 to 5. She met her future husband, Todd, in 2013. He encouraged Annie to write and play music again. This collection of songs contains a voice full of passion, power, desperation and love for Maamaa Aakii(Mother Earth). Annie Humphrey will begin her "Beast and the Garden," tour September 1, 2017. 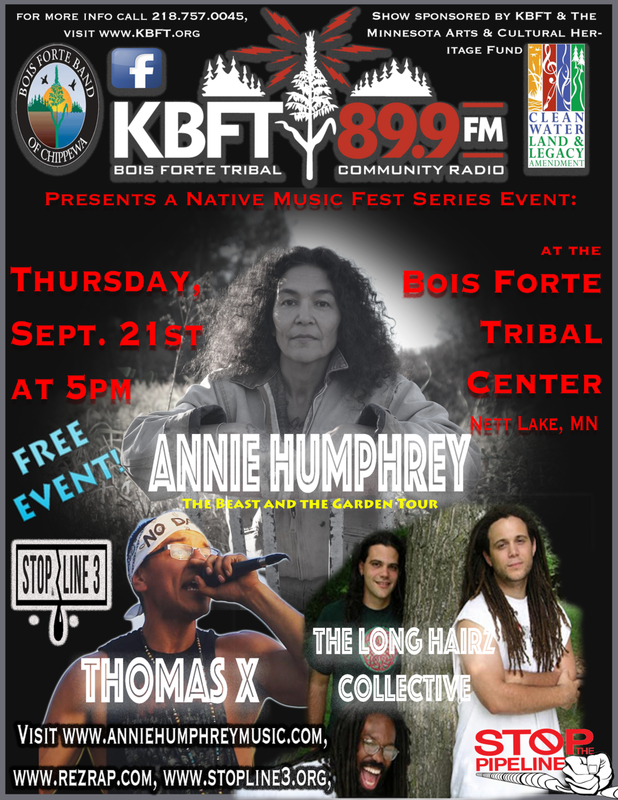 Fan Pre-sale tickets and Special Benefit Seats (including a reception with the artists) go on sale for our concert with Bonnie Raitt and special guest Annie Humphrey on Sept 1st at Bluestem Amphitheater in Moorhead, MN to benefit HONOR THE EARTH! To access these pre-sale tickets and benefit seats, take a moment to visit bonnieraitt.com/members (in advance of Tuesday morning) and register for Bonnie’s Fan Community. There is a very limited number of Special Benefit Seats and they can only be purchased through bonnieraitt.com starting Tuesday 4/25 10am CT.
Madeline Island @Marty Curry's theater. Fortune Bay Resort Casino "Lounge"